This morning we had the oppurtunity to ski the 8.3k Holmenkollen race course that will be used for tomorrow’s 30/50k freestyle World Cup. 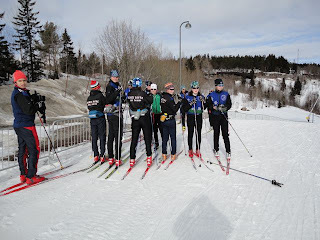 This was another eye-opening experience, because we were skiing directly with the likes of Marit Bjoergen, Therese Johaug and Emil Jöensen. The course was absolutely awesome. It had some challenging corners (enough for Isaiah and George to fall on), and also very skiable hills. Its gonna be a really tough race there tomorrow. Here are some pictures of the team on the course.